Jeffrey Stark, 30, was the youngest of five children. He spent the first few years on his own behind a desk for Paine Webber when he changed plans and followed his two older brothers into the FDNY in 1999. He was an outdoorsman and loved fly fishing, camping and hunting. Stark played guitar and was an avid reader. He was also working on plans to get married to his long time girlfriend whom he had chauffeured, and encouraged through her entire four years of law school. Although fires “made him nervous,” what really worried him was ever making mistakes in front of his brother firefighters. 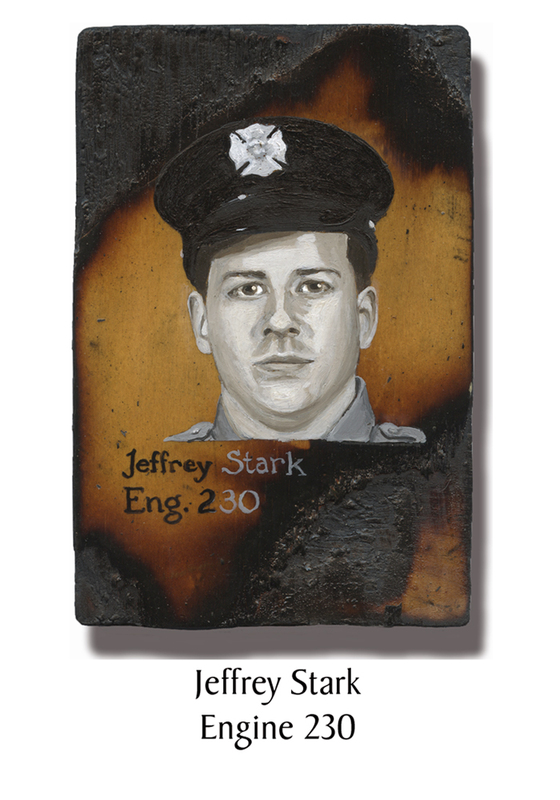 This entry was posted in Better Angels Stories and tagged 343, 9/11, better angels, Dawn Siebel, Engine Co. 230, FDNY, firefighter, firefighters, firefighters of 9/11, Jeffrey Stark, LODD, Manhattan, memorial, NFFF, paintings, portraits, World Trade Center, WTC. Bookmark the permalink.